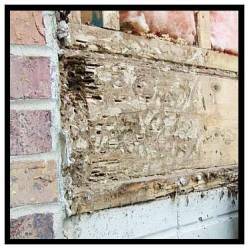 Examples of home inspection "discoveries"
Termites – It is not uncommon to find termite damage in the Lincoln area. This was a home that had been treated for termites prior to my inspection, but it was believed there was no damage - until I found mud tunnels near the siding and foundation. I asked the homeowner to remove the siding to reveal if there was any structural damage. This photo was taken after the siding was removed. The termites hollowed out the sill plate and the rim joist. Over $5000 in damage was discovered as a result of my inspection. 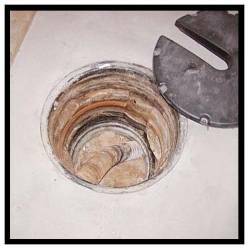 Sump Pits – It is common for homes to have sump pits without sump pumps, which is not a concern, unless the pit fills with water, which has obviously happened in this home judging from the discolored walls of the pit. I warned the new owners of this house to carefully monitor this sump pit during wet, rainy weather and suggested that if it does fill up with water that a sump pump must be installed to evacuate the water from the house. Mold – In this home there was mold under the roof decking, which is common in poorly ventilated attics, however this attic was well ventilated and there was little evidence of leaking or any obvious source of moisture (mold also occurs above exhaust fans, but in this house those fans exhausted through the roof). 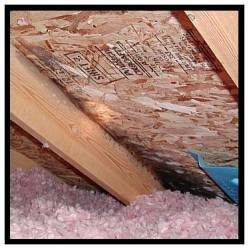 I concluded the problem was a result of unusually high interior humidity, which infiltrated the attic and condensed on the decking. Later it was discovered that the furnace humidifier had malfunctioned, doubling normal humidity levels. 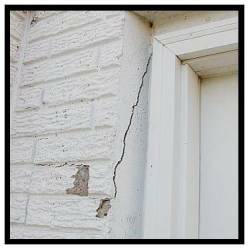 Foundation Cracking – Some foundation cracking isn’t a big problem. Concrete cracks naturally when it cures, plus it cracks further as a result of thermal expansion and contraction. In the picture to the left, the cracking is unnatural and is ongoing as is evident by the unpainted, chipped concrete. This foundation is cracking as a result of poor design and “concrete creep”, which is a very serious problem. Fortunately, there are often ways to minimize the forces and stresses that act on foundations to minimize the problem. 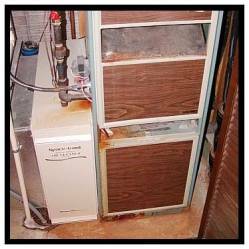 Furnace / Air Handling System – Furnaces are a big challenge for any home inspector or contractor because of multiple components and unknown histories. It is up to the inspector to determine what problems might have occurred in the past and what may occur in the future. Rust stains on this unit indicate a past condensation line leak from the tray under the air conditioner evaporator coils. Rust can cause pre-mature wear and deterioration of major components of a furnace. 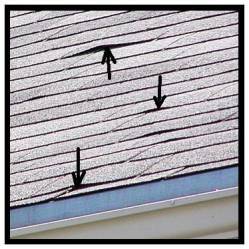 Roof Problems – Roofs are one of the most important components of a home. The roof inspection is vital. I typically always climb the roof, or at least get up to the roof via a ladder, unless weather conditions or other issues prohibit me from safely accessing the shingles. This photo illustrates a common problem called "fishmouthing". Pneumatic guns make roofing fast, but hasty installations create problems because it is sometimes difficult to gauge proper pressures and nail depth with pneumatic tools. The picture shows a roof where the shingle tabs didn't seal down because the fasteners were protruding due to not being installed properly. In the future these shingle tabs might blow off the roof or the fasteners will eventually poke through the shingle material.